The best cities become an ingrained part of their residents' identities. Urban design is the key to this process, but all too often, citizens abandon it to professionals, unable to see a way to express what they love and value in their own neighborhoods. 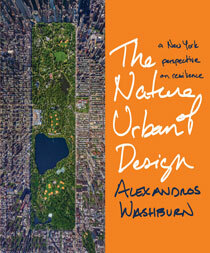 In this visually rich book, Alexandros Washburn, Chief Urban Designer of the New York Department of City Planning, redefines urban design. His book empowers urbanites and lays the foundations for a new approach to design that will help cities to prosper in an uncertain future. He asks his readers to consider how cities shape communities, for it is the strength of our communities, he argues, that will determine how we respond to crises like Hurricane Sandy, whose floodwaters he watched from his home in Red Hook, Brooklyn. Washburn draws heavily on his experience within the New York City planning system while highlighting forward-thinking developments in cities around the world. He grounds his book in the realities of political and financial challenges that hasten or hinder even the most beautiful designs. By discussing projects like the High Line and the Harlem Children's Zone as well as examples from Seoul to Singapore, he explores the nuances of the urban design process while emphasizing the importance of individuals with the drive to make a difference in their city. Throughout the book, Washburn shows how a well-designed city can be the most efficient, equitable, safe, and enriching place on earth. The Nature of Urban Design provides a framework for participating in the process of change and will inspire and inform anyone who cares about cities. "Mr. Washburn takes lay people on an illustrated and highly accessible tour of urban planning, from the High Line to the subway system, which, he explains, emits little more in greenhouse gases than the city's streetlights." "Sensibly organized and lavishly illustrated, the book will interest all urbanites, and especially urban planners." "a treat for anyone who loves living in cities and wants to make them better, including professional planners and architects." "[W]ith his first book, Washburn has accomplished, if not quite the impossible, then certainly the daunting: he's written a concise and accessible treatise on urban planning, blissfully free of jargon and clear enough to be understood by both professional and citizen-designers." "Entertaining and attractively designed...a fantastic introduction to the discipline of urban design for non-designers. ...Washburn's approach to resiliency is both idealistic and practical." "...a refreshingly practical take on the power of urban design and its role in crafting the tools that guide and shape development." "It's perfect reading for a rainy, rainy day." "Washburn helps the reader look at the city differently, and care about its future. His approach works regardless of your city." "...the book is about more than how neighborhoods and community's can survive times of crisis; it's about how neighborhoods and community's can thrive in the midst of everyday life..."
"Alex Washburn performed the miracle of writing a book about cities that appeals to experts and general readers alike. His idea of urban design is convincingly inclusive, with buildings, people, nature, infrastructure, and public space playing prominent roles." "Alex Washburn shows planning in New York as it is really done: with the technical requirements, the political difficulties and the dreams. Urban leaders around the world will learn much from this insightful book about designing for greater resiliency to climate change." "Washburn's generally straightforward organization allows readers to use the book like a design manual. He eschews technical jargon for an accessible and approachable tone and language. Beautifully produced with abundant color illustrations that effectively contrast worldwide approaches to urban design, this volume will appeal to a wide specialist and generalist audience." "Washburn's attitude and incisive analysis give this book a rare combination of realism and hope." "Simply put, The Nature of Urban Design reads like an engaging story, through the eyes of a well-informed urban planner, who wants nothing more than to see good done in the world." "The writing is personal and accessible, and ... the book is knowledgeable and up-to-date. ... This book will be especially useful to people interested in improving their city, and for those who are contemplating going into planning or urban design as their profession." Chapter 1. Why Should We Care About Cities? As the storm surge of Hurricane Sandy overwhelmed his neighborhood of Red Hook, Brooklyn, New York City’s chief urban designer Alexandros Washburn took refuge on the upper floors of his house. For years he had played an integral role in creating the city that has become a model of vibrant urban design, and now he watched as flooding wreaked havoc. When the water receded, he saw devastation—but also dedication. The disaster revealed that what makes New York great is not only its physical setting, but also its citizens’ will to rebuild their communities better than before. In his book, The Nature of Urban Design: A New York Perspective on Resilience, newly available in paperback, Washburn explores how citizens change cities to meet the challenges of our times, like improving resilience in the face of climate change. Read on below.